during the Monster Energy NASCAR Cup Series Toyota Owners 400 at Richmond Raceway on April 13, 2019 in Richmond, Virginia. 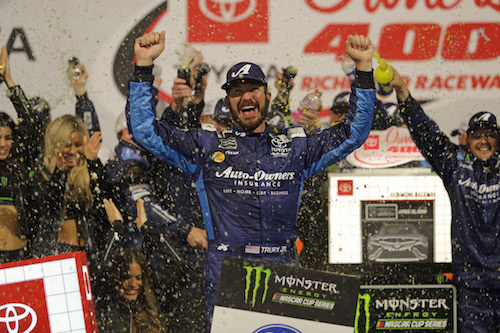 The 81st time was the charm for Martin Truex Jr. Saturday night at Richmond (Va.) Raceway, as the 2017 Monster Energy NASCAR Cup Series champion claimed his first-career short-track win when he took the checkered flag in the Toyota Owners 400. 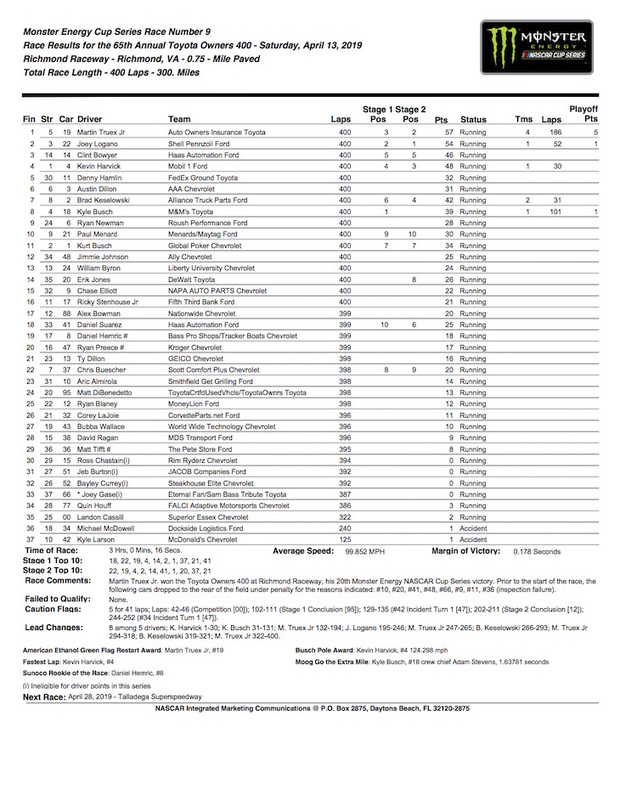 The win was Truex’s first of 2019, nine races into the season but the sixth for Joe Gibbs Racing. Joey Logano finished second after passing Clint Bowyer with four laps remaining in the 400-lap race. Bowyer was relegated to third. Bowyer took second just before a cycle of green-flag pit stops with 85 laps remaining and returned to the position when the cycle completed, just as Truex had returned to the lead. After the final pit stops, Bowyer gradually closed on Truex before losing his position to Logano. Truex led a race-high 186 laps, but he failed to win either of the 100-lap stages that made up the first half of the race. Instead, Kyle Busch and Logano were stage winners. Busch took the lead when he passed pole sitter Kevin Harvick on lap 31 and ran up front for 101 laps before a pit-road speeding penalty during a lap 128 caution for a Kyle Larson spin that resulted from a left-rear tire issue. Larson had made an unscheduled pit stop for a tire rub just over 10 laps earlier. Truex first took the lead, courtesy of Busch’s speeding penalty. Truex, then, led most of the remainder of the second stage, losing the top spot to Logano on lap 195. Truex reassumed his position up front when he got out of the pits ahead of Logano during a lap-243 caution for a Michael McDowell incident. Brad Keselowski passed Truex for the lead with 134 laps remaining, but Truex retook the position on lap 293 and led most of the remaining laps. Kevin Harvick finished fourth, and Denny Hamlin rounded out the top-five after staring the race in the back because of a post-qualifying/pre-race inspection failure. Hamlin’s car was one of eight moved to the back of the race starting grid because of inspection failures. He was, though, the only one among the group to finish the race inside the top-10. Daniel Suarez and Erik Jones also were among the eighth. Suarez was the first to climb into the top-10, doing so before the first stage ended at lap 100. By the halfway point, Jones also was in the top-10. Jones wound up 14th at the finish after a slow pit stop to allow his team time to install a wheel spacer. Suarez finished 18th. Austin Dillon was the only Chevrolet driver to finish in the top-10 in sixth. Other top-10 finishers included Keselowski in seventh, Busch eighth, Ryan Newman ninth and Paul Menard in 10th. Below, is the complete finishing order of the Toyota Owners 400 at Richmond Raceway.